Thank you to everyone who came out to audition for Sound of Music. As always, we are blown away by the talent in this county. We commend your bravery and applaud your positivity through this process. We had to make some very tough choices, but this is true with the casting of every show. We would like to congratulate those chosen to be in our 2019 summer production. Rehearsals for the children will begin on Tuesday April 2nd at 4:00 at the Zane Music room. The Nuns Chorus will begin rehearsal on May 8th at 5:30. Emails will be sent out soon with more details for cast members. If you have any questions or your summer plans have changed, please let us know as soon as possible so we can recast your part. Thank you again and we'll see you soon!! 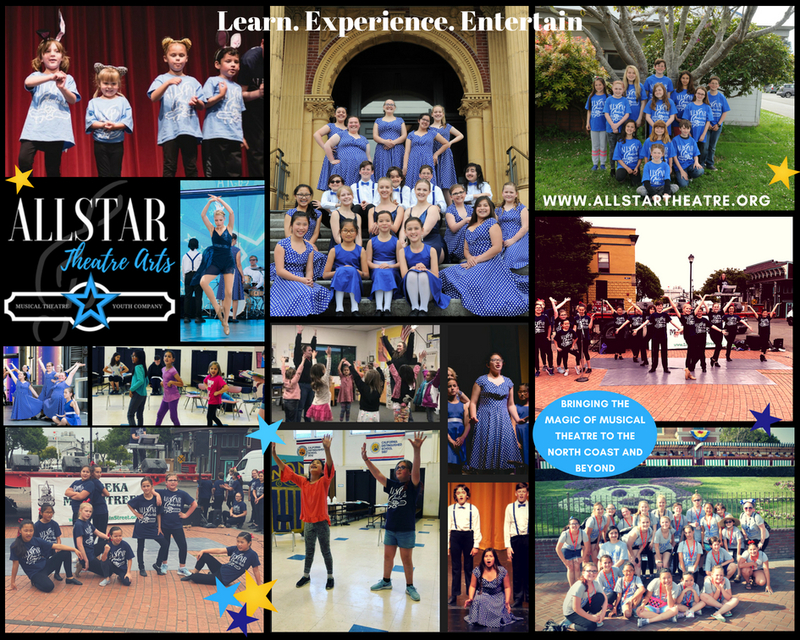 Our Allstars are a group that performs at various local events, from the Botanical Gardens, local showcases, musical venues, schools, and even travel opportunities to perform outside of Humboldt. Allstars perform year-round. In addition to the 'Junior' Allstars that we added last year, we created an advanced 'Gold' Allstar group as well as the 'Spotlight Singers' group. Group sizes are limited and and acceptance is by audition only. 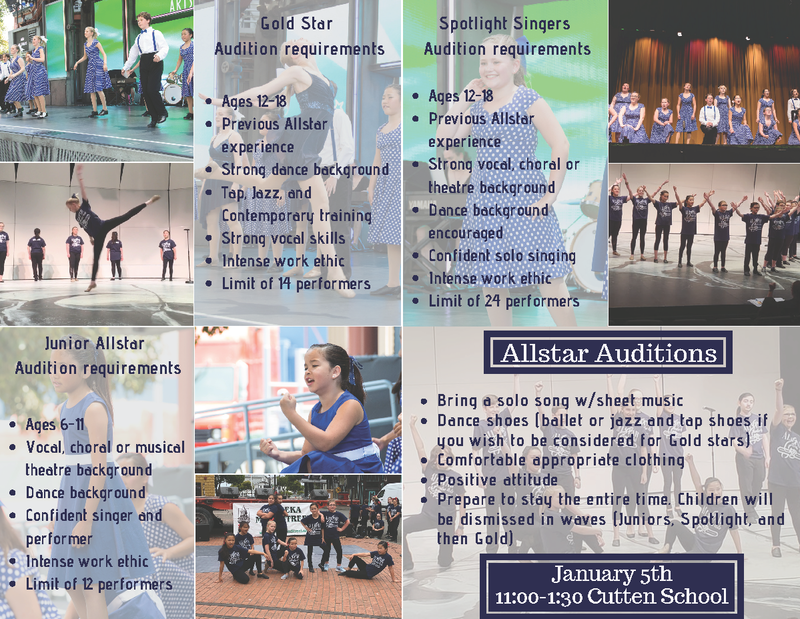 CLICK HERE for audition criteria or contact us at info@allstartheatre.org or call (707) 502-2658. Spring session starts January 19th! Check out our Spring 2019 Theatre Academy offerings! Sing! Dance! Act! These fantastic classes let everyone be a star through the magic of musical theatre with songs and dances from the musicals of yesterday and today. Young actors will learn performance skills, the importance of working as a team, cooperation and collaboration all in a supportive and positive environment!! Email info@allstartheatre.org for more information or call (707) 502-2658. 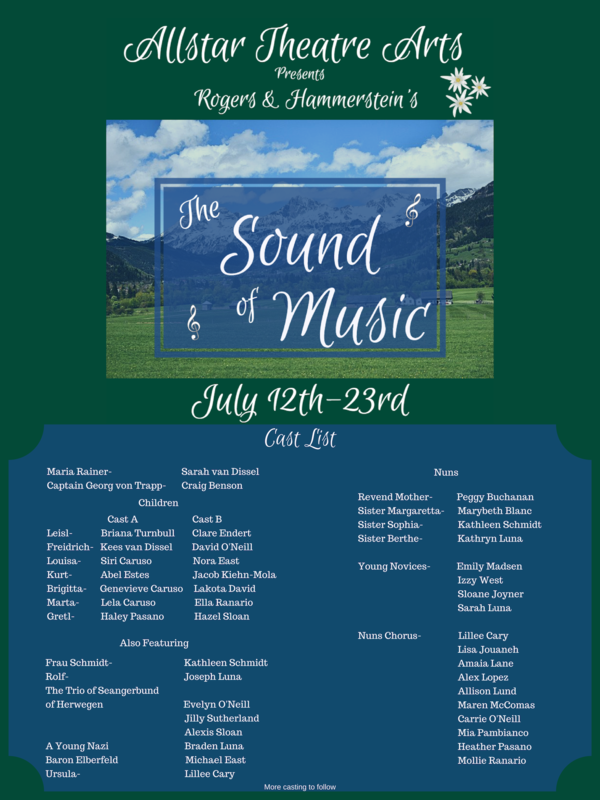 Allstar Theatre Arts will be performing Rogers and Hammerstein's classic musical, "The Sound of Music" this summer - July 12 through the 23rd at the EHS Auditorium. Auditions are being held at Zane Middle School (Music room) on March 16th from 10:30 to 2:30. To sign up for auditions and other details, please click the link below to view our productions page. An Ink People Dream maker project, Allstar Theatre Arts fuels the creative spirit of local youth by developing, empowering and advancing young artists. Our program includes productions, classes, in-school program, community appearances, and a leadership development component, ATA provides affordable and meaningful arts experiences for Humboldt County families, children, and teens.